I've been working on a very fun trade with a lovely lady - this duffle bag is for her sister. I just received the black top grain horse hide, and I love working with it; next to the rawhide leather from this fall, it is my absolute favorite. I'm tempted to make one for myself, but making one takes me about 12 hours, so I don't know where I'll find that time! Lately I've been drifting less towards making as many bags as I can in a day, and instead find myself drawn towards putting more time and effort into making each one perfect, details and all. I'm a lot more calm when I work that way and I get less stressed about everything I need to do. I tell myself it's not a race (except a race against myself I suppose) and I will go at my own pace. 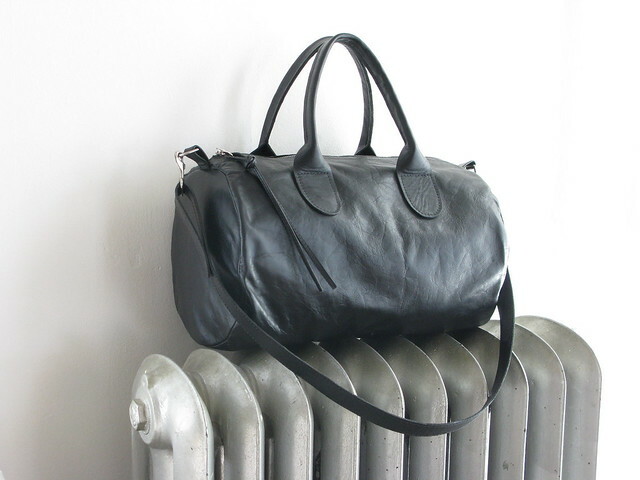 So, I'll probably be making the duffle bags as made to order from now on. I know maybe not as fun as receiving one right away in the mail, but I think it's a better way to do it. Plus, then you can pick the lining and tell me how long you'd like the cross body strap to be - so maybe it is more fun after all! Later today I'll be posting some as made to order, so keeps your eyes peeled!